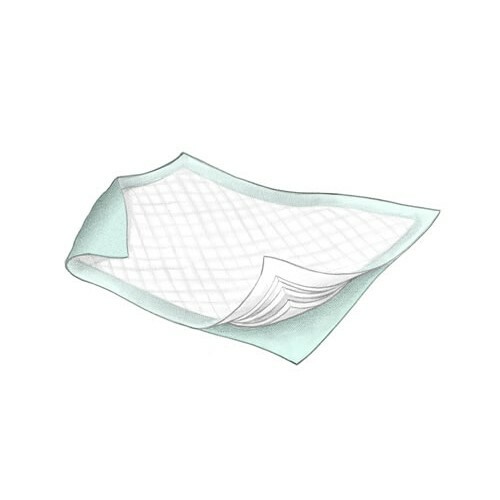 Durasorb Disposable Chux Underpads, manufactured by Kendall, are highly absorbent hospital bed pads. This heavy absorbency fluff underpad can be used as a chair or bed cover. Durasorb Disposable Chux Underpads are spunbond nonwoven topsheets that transfers fluid quickly into the fluff core. 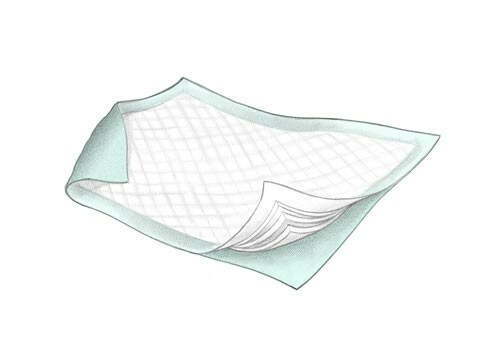 The fluff core provides incontinence protection for the underpad and maintains patient comfort. The diamond-embossed pattern and polypropylene backsheet for the underpad allows for stability and utilization. It also helps heavy absorbency needs with a non-polymer construction. The polypropylene backing for the underpad also helps to protect against leakage and resists melting. This makes it ideal for use as an overnight pad. Durasorb Disposable Chux Underpad by Kendall comes in a light blue color. I wish I had ordered the McKesson pads I usually get. These are very thin and I use multiple pads where I only need one of the other brand. I guess you get what you pay for. The pads are exactly as described and work extremely well for the purpose I have chosen - cat litter box over the litter. Saves on litter changing, no odor, pet does not object to their presence in the box. I use these as piddle pads for my cat. Easy to change and discard and relatively inexpensive compared to store bought. Still would like to have the delivery driver place them so the whole neighborhood does not see them in front of my door with the contents listing facing the street. I have requested this and was told it would be passed on to the driver as requested. I happened to be home when they were delivered and sure enough, the box as placed right in front of my door with the writing facing the street. I asked the driver if he had the request to place it to the left on the porch and he said no. Other than this negative, I am satisfied with the product. Not what we expected at all. Very thin and flimsy. Ordered 3 cases and needed to double the number of pads we used so the price was not a deal. Would not recommend . These under pads by Kendall are one off the best on the market. I've tired other brands and they are thinner and less absorbent. I'll stay with the product that's working best for me. Quality pads for a great price! These are great pads. Value exceeded my expectations. Fast shipping-thanks! I've had great results with these underpads, and I enjoy being able to buy a case at a time for the price. Thanks! We needed this product due to the normal problem of aging. It works perfectly. It absorbs, taking care of the problem without fuss. Greatly recommended with a price that is affordable. Better than any puppy wee wee pad out there! I could not live without these underpads! I have several small dogs, all Toy Poodles, and they are trained to potty on wee wee pads. I used to buy the ones specifically for dogs and puppies with the scent attractant which is useful for the initial training of puppies or new dogs, but they can get expensive if you go through a lot like I do. Since dogs are locational animals by nature, once they are house trained to go on a pad, they will always go there as long as you always put the pad in the same place. I use a 24 X 20 X 5" dog litter pan (make sure you get the right size - Puppy Go Here and Purina Second Nature makes them). I tried the litter that is made for the box, but found that it just made a huge mess and I was always afraid my dogs would eat the litter. The pads used in combination with the liter box is the perfect solution, since the dogs go in the box they don't "miss" the pad, and there is also a bit of a barrier if you have male dogs who lift their leg. No more pee on the floor under the pads! The 23 X 36" underpads fit perfectly in the bottom of the litter box when cut in half, so you actually get twice as many pads as you buy, a case of 150 is actually 300. At the time I bought them, it came to about 8 cents a pad. I guarantee you there is no cheaper wee wee pad out there. These pads have good absorbency, and are cheap enough to change them frequently as they get soiled. The litter box rinses clean easily and just put in a fresh pad! I also use the 23 X 24 pad with a pad frame with great success. Awesome product, awesome price! Thank you, Vitality Medical! I was pleased with the timely arrival of the product - I have used these pads as piddle pads for my cat and been very satisfied. My only negative comment - when delivered to my house, they are placed on the front porch by my door and anyone can easily see what they are as the contents is listed in the carton. Could these be put in a generic outer carton for privacy of the recipient?